The Institution of Rev’d Nerys Brown as Rector of St Mary’s Dunblane by the Right Reverend Ian Paton, Bishop of St Andrews, Dunkeld and Dunblane, will take place in St Mary’s Church on Saturday 24th November at 1pm followed by a celebration in the Hall and in a yurt on the Rectory lawn. Parking will be on the dual carriageway and around the Cathedral. Please email the vestry secretary at vestrysec @ stmarysdunblane.org if you need a disabled parking space. Please be seated by 12.45. In case of large congregation numbers, the service will be relayed to the Church Hall. A collection will be taken for the Training Fund of the Scottish Episcopal Institute. Dress for clergy is alb and white stole. Robing will be in the Rectory behind the Hall and Church. 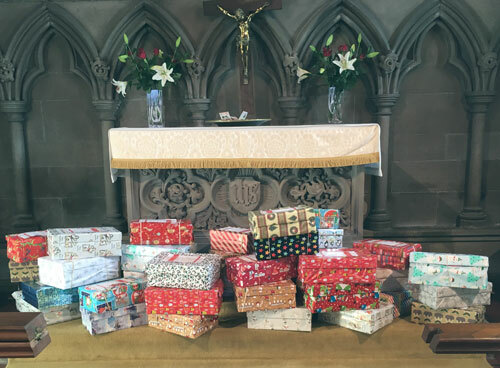 Thank you to everyone who filled shoeboxes for the Blythswood Care Christmas Shoe Box Appeal. It is 25 years since Blythswood Care began their Christmas Shoe Box Appeal and, since then, over 2 million gift boxes have been received by young and old, bringing a rare moment of happiness for those in winter poverty. This year, shoeboxes will be distributed to Albania, Bulgaria, Hungary, Kosovo, Moldova, Romania, Serbia and Ukraine. When I retired from full-time ministry in July 2016, I imagined that I would not be writing any more “Rector’s letters” for a church magazine. But, as the saying goes: Never say ‘never’. Even so, I am reasonably certain that this could be the last one. I have, though, been glad to have had this opportunity to help out during the vacancy. For a priest, it is an enormous joy and privilege to celebrate the Eucharist. That is what we are ordained to do after all. To preside at the Eucharist is no solitary task, however, for the priest does this on behalf of and together with the community, the Church gathered together in this place and on that occasion. It has long been the custom for representatives of the congregation to bring forward the bread, wine and offerings of money, to be presented and offered to God by the priest at the altar. What is going on then is a highly significant and symbolic action. The elements represent what we bring: who we are, the fruits of our labour, which the priest gathers up, presents to God and in what follows presents God to the people. To give up something in order to gain something greater is a way of describing what a sacrifice is. The word itself means “to make holy”. What the priest is offering at the altar is our poor – yet, paradoxically, precious – gifts, “ourselves, our souls and bodies” as the Prayer Book says. Through the action of the Holy Spirit they are transformed, given new significance, made holy and returned to us, now made infinitely more precious, the Body and Blood of Christ. To be called to play a part in this is a wonderful gift. That is why I am grateful to God and to yourselves to have been able to fulfil my priestly rôle these past seven months. It has been a way to offer to God, and to give back to you, all the kindness, support and love that we have received at St Mary’s. 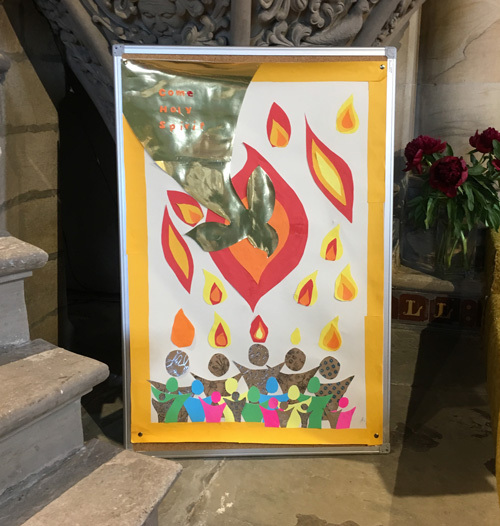 The Harvest Supper raised £250 for flood relief in Kerala and the collection at the Harvest Thanksgiving service provided 56.5Kg of goods for Start Up Stirling – Thank you! As the days go by my anticipation level rises. I believe that St Mary’s is about to start a new and exciting chapter in its history. As you all know we have a new Rector, Revd Nerys Brown; she isn’t here yet, but she will be, if all goes well, some time in November. As she comes back to us she will find that the St Mary’s she left is not the St Mary’s she’s coming back to. We have moved on and done some good and exciting things. When she left us, we had no Messy Church, our church building was not the well cared for newly renovated place it is now. Young Church and the Youth Group were not so great in numbers and were not the thriving groups they are now. Many people have worked really hard to make these changes and they are good ones. You may very well be able to add more to my list, I haven’t been comprehensive. Many of these changes are Nick’s legacy to us, and for that we must thank him. Now it is time for us to move on some more, as Nerys comes to us, for just as we have moved on since Nerys was last with us, so Nerys too has moved on since she was last with us. She left us a Lay Reader, and a very good one at that, who had worked hard with the children in Dunblane, going into the schools, being one of the people behind the development of Radio Rainbow, which has now run for many years. She comes back to us a mature, creative and effective priest, ready, willing and able to lead us to a deeper discipleship and a renewed commitment to our Lord and Saviour and to the tasks he sets before us as we live to bring his kingdom closer in our changing and sometimes frightening world. She also comes to us with a very different kind of authority to share with us than she had before. Then she was our lay reader, under the authority of our Rector. She comes back to us as our Rector, with all the authority her office bestows on her and that is a very different place to be. Exciting times are ahead, please pray for Nerys as she prepares to come to us, and for St Mary’s that we will welcome and support her and the new things she will help us to see and do. Following a meeting of the Vestry of St Mary’s Dunblane the Revd Nerys Brown has been appointed as their new Rector. Details of date of institution will be confirmed when available. Please hold Nerys and the congregation in your prayers. This year is the tenth anniversary of the adoption of Creationtide by Churches Together in Britain and Ireland. Running from 1st September to St Francis day on 4th October, it is a time when churches and congregations are called to pay special attention to the responsibility of humanity for the Earth and for all that live upon it. We enjoyed this summer’s hot, dry weather but we know there is a downside – wildfires in many parts of the world, deaths from heatstroke and no doubt we shall soon be paying more for our food as the drought affects crops. In addition to global warming there is the problem of pollution, the indiscriminate use of plastics being the most recently-raised concern. Although most Christians share the general concern about these environmental crises, Creationtide draws on much deeper roots in Scripture and in older Christian traditions of the relationship between God, humanity and the created order. 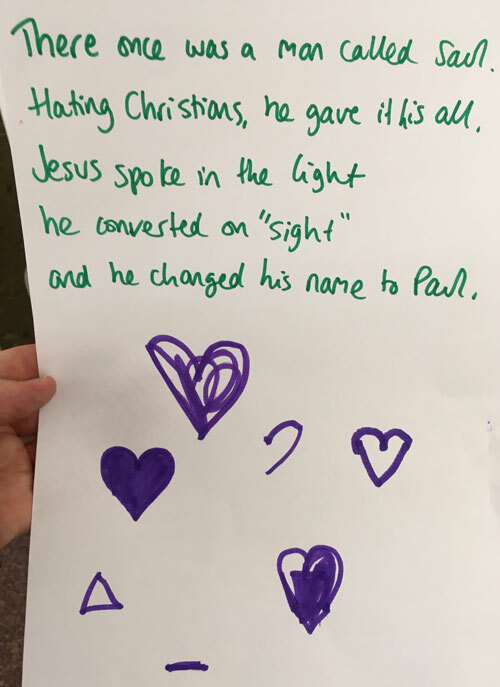 When I was preparing an all-age service for Creationtide in my last charge, one of the Junior Church leaders said she thought it was “a distraction”. Perhaps she thought the Church should only preach about our relationship with Jesus as our personal saviour. There is plenty in the Bible, however, about our responsibility for the environment. The opening chapters of Genesis show that God finds his creation very good and that he shares the work of caring for it with us humans. Jesus refers to God’s care for the birds of the air and the flowers of the field, while Cain’s question “Am I my brother’s keeper?” is a clear indication that our personal salvation cannot be divorced from that of our fellow men and women, nor from the well-being (“shalom” is the biblical word) of the whole of creation. Dunblane Churches Together are celebrating St Blane’s Day with a Safari Service which will start at Holy Family Church at 2:30pm and, via St Mary’s finish with refreshments at the Cathedral Halls. As many of you will know, for almost three months I was unable to drive, for medical reasons, and I have been reflecting on that experience. Firstly, there are huge thanks due to all those, in the congregation and beyond, who ferried me from place to place; secondly, there are huge thanks due to all those who walked Bella, again from the congregation and beyond, especially to my neighbours, who latterly took on that job fulltime and walked Bella when they walked their own dog. Thirdly, one of the things which concerned me most was my loss of independence – which I really value, my feelings of impotence, and my need to depend on other people; it isn’t something I am used to having to do. But where does God come in to all this, and what have I learnt from it? That’s a more difficult question. It’s more than probable that I needed a knock on the head to alert me to the fact that I don’t and never can operate alone, doing it all myself. Yes, of course I know that I need to live in God as God lives in me, and that the God space in me is of supreme importance. But I’m equally aware, which I suspect is maybe the case for a good number of us, that I can, and do, on numerous occasions, ignore that fact and go my own sweet way regardless. So my resolve is to “check-in” with God more often than I have been wont to do throughout the day, so that I may learn to see the world more fully from God’s eyes and not from my own, sometimes distorted, view, and hopefully, act more of the time in God’s way rather than my own. As the holidays begin I want to wish you all a very happy enjoyable blessed time of refreshment and re-creation and look forward to seeing you all after the holidays, fit, bouncing and raring to go. Nine members of the youth group enjoyed an evening of trampolining and other fun activities at Jump ’n Joy in Tullibody on 19th May. Despite the extensive health and safety warnings of various ways to injure or kill yourself we all managed to survive in one piece! Our annual sleepover event is planned for Saturday 23rd June when we will spend the night in the church hall. The theme for the evening will be “Life is like a box of chocolates”, and amongst other top secret exciting activities we’ll be watching the film “Forrest Gump”. 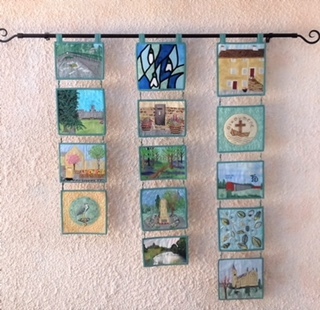 Some of our congregation are members of the Allan Water Patchers, who have created a lovely set of patchwork banners hanging in the Dunblane Museum – See the image below. Each shows a Dunblane landmark or something which the area is known for. For most of May I was on locum duty at the Cathedral in Gibraltar, where we were made very welcome and had, apart from the daily services, time to explore. Our flat overlooked the harbour and we could see three countries (Gibraltar, Spain and Morocco), two continents and two seas (the Atlantic and the Mediterranean). The numerous ships passing up and down, or across, the Straits added to the sense of being in an in-between place, neither Spanish nor British, Christian yet with Moorish and Jewish influences. All this got me reflecting on how our faith takes us on a journey. Much of the Old Testament is the account of a journey, not only of a nomadic people but also of a people whose wanderings led them to a fuller discovery of God. In the Gospels, Jesus observed that “the Son of Man has nowhere to lay his head”, while the stories of the disciples in a boat from early on became a metaphor for the Church. Even though we may live in houses and have buildings to worship in, we Christians are, like the Israelites in the desert, people on a journey. As the Pentecost story tells us, our faith came into being in a place where different countries and cultures met. For ourselves, our faith will have developed and matured under the influence of the people and events we have encountered on our life’s journey. So far I have not mentioned the one obvious thing about Gibraltar – the Rock. Strangely enough, when you are in the town you can’t really see it. But even that has something to tell us about the life of faith. For us Christians our faith is founded upon a rock, the God and Father of our Lord Jesus Christ. Even when we can’t see him, he is there, the defining presence amongst all the changes and chances of this mortal life. Messy Church will meet again on the 8th May with the theme of baptism. As “Dunblane Rocks” on Facebook grows, we have made a few cornerstones to hide alongside them.